Yesterday, I took the initiative to take my own sofa out. I got further along then I expected but got snagged with an unknown (to me), which turned out to be a hex socket thing-a-ma-jig. When Roger & John realized I had already started and how far I had gotten – think they were surprised a bit. Well, so was I. And my little drill that Andy suggested I buy was awesome. Turns out Roger has one too. Nonetheless, they got the big guns out and the rest of the sofa was done in short order. Out the door everything went. 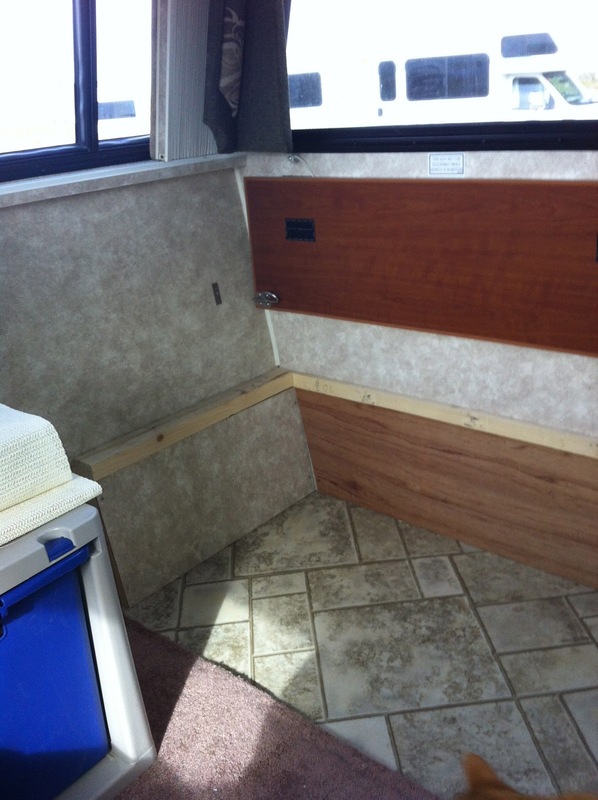 I thought I would save the plywood, the other wood, veneer as well as the cushions to be used down the road. But… the guys pointed out, it wasn’t worth saving the wood. The cushions would have been saved if I could have stored them on end. As it was, there’s no room for that. 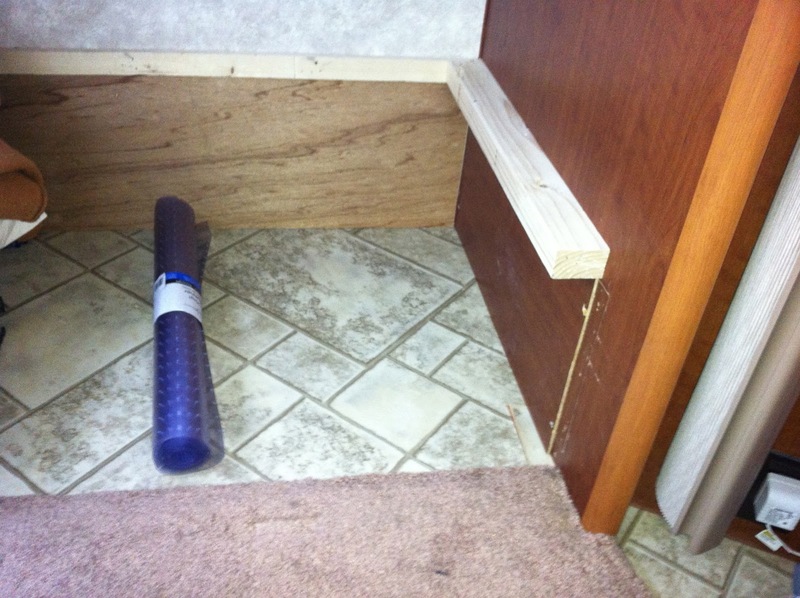 The ledge is left in place and will be utilized as a shelf later. I will probably stain or paint the ledge too. On left end (picture at left), is the wiring for rear lights, etc and is insulated, so panel is kept in place. The veneer shown at bottom rear of wall, was originally part of the base of the sofa, I decided to re-utilize it as a secure backing of the former storage bin, which I will insulate. It eliminates any chance the cats can get thru. John had a saw to get the left corner angle done for a better fit. The dark wood near bottom of window will stay for now. It was the piece that allowed the sofa back cushion to be slanted for comfortable seating. And interesting discovery by many here. Each Lazy Daze has different size sofas. A RK is about 7″ longer, a RB is 9″ longer, etc. And none of the MB folks needed new cushions. So all went to the dump! So if you are just starting to read my blog and wonder why I took the sofa out. I hope to put in my small floor loom (Baby Wolf) and a flexible desk/work space in this area. I will work on this next winter. I needed the sofa out so when I go back to Alaska in May, I can get my loom into my rig. I spent most of today organizing all that was broken down when the sofa was dismantled. The cats were furious with me for eliminating their path around the windows in the rear. So I compromised and put my plastic storage bin back in place on the carpet, right next to the remaining sofa. I will get one or two of those perches one can get for cats to put along the other window. They seem a little more at ease with how things have changed. I also put there kitty litter box back there, I had been keeping it between the front seats when not traveling. I went and dumped my tanks today, and got water too. I could have lasted at least another 2-4 days, but didn’t want to deal with it when I left. So all is now good until I get to boot camp. Laundry will need to be done soon, but may wait until I get to Boot Camp to do it. Time will tell if another opportunity pops up. Of course, Mother Nature has other plans, such as rain showers, now that my work is done, although I have one last task to do, well not me per se, but someone else. So will figure it out tomorrow. If I can get my motion sensor done, I might still spin. After having seen your LD it makes it all more interesting. Glad you got the sofa out. Let me know how the new motion light works. I also will need to go to Boot Camp so anticipating your experience there.